Seattle Pho-natics is a group of pho-lovers that meet once or twice a month to sample different pho restaurants in Seattle. The club’s president, Sean Hoops, wrote to inform us they have over 150 members nationwide with up to 30 members showing up for a meeting. Billy Hong shared a fabulous video he created as a project for a design class at UC Davis. The video provides a general history of pho and a detailed recipe. The video is informative, clever and entertaining. Billy tells us the recipe is his late mother’s and the video is partly a tribute to her memory. Nicely done Billy, your mother would be proud! I have a 24” square Bradford Tray from Pottery Barn. So I can decorate it for holidays or for whatever suits me, my husband had a piece of beveled glass cut to place inside. 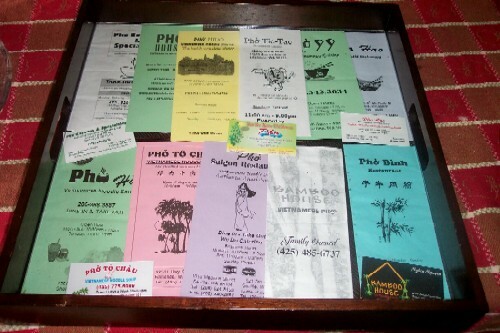 I decided to take my collection of takeout pho menus and business cards and place them under the glass. 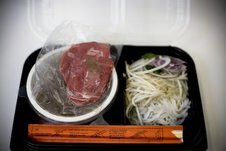 The tray is a perfect size for two big piping hot bowls of pho and all the fixin’s and utensils! It takes hours and hours to make a good pot of pho. Cooks sometimes simmer their broth overnight and for 10 or more hours! So using a slow-cooker or crock pot to make pho seems like a logical and convenient way to make pho broth. Imagine how awesome it would be to walk in the door after a long day and be greeted by the delicious aroma of pho? Jaden at SteamyKitchen offers this simple recipe for making pho in a crock pot. A crock pot, she notes, is perfect for simmer pho broth because the heat produced is not too high and can result in less evaporation than simmering on a stove. 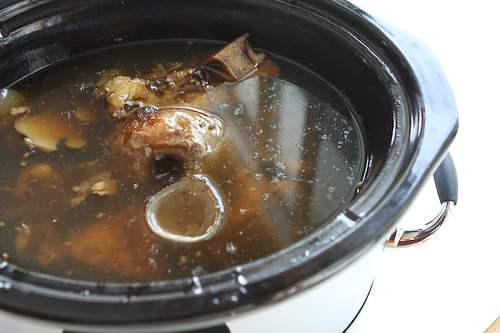 It’s critical not to skip the important steps of par-boiling the beef bones and charring the ginger and onion to produce clear, flavorful broth she adds. Calling all Aussies! We just added the third country to our Pho Restaurant Directory: Australia. There are currently about 50 locations listed with the majority clustered around Sydney and Melbourne. Adding a directory for Australia made a lot of sense because of the large population of Vietnamese living there. You can read more about the background of pho in Australia on LovingPho.com. Please help us get the word out to Australian phonatics, Vietnamese food lovers and Australian bloggers so we can keep the directory updated with new restaurants and reviews. Earlier this week the 2,000th restaurant was added to the pho restaurant directory. We appreciate everyone’s ongoing support and assistance with restaurant submissions and reviews. The 2,000th entry was Drunken Noodle located in Fargo, North Dakota. Previously there were no pho restaurants listed anywhere in North Dakota. Now we know of at least two listings — both located in Fargo. Pho from a mobile home? Erh? That was our initial reaction to a tip from a Houston area phonatic about Pho Binh Trailer. The restaurant is actually a converted mobile home with additional seating available in an add-on area; it sits next to a drainage ditch. 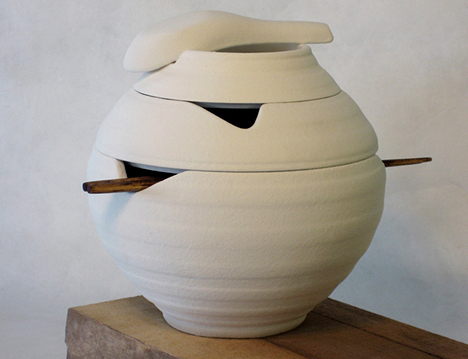 Yanko Design features an elegant design for an all-in-one pho bowl set by Omid Sadri. When stacked together the bowls and plates take the shape of a lantern. The broth is made with beef bones, oxtail and brisket; the pho noodles are parboiled; and each order comes with raw slices of eye of round, the requisite herbs and dipping sauces. All the ingredients are packed separately for reassembly at home. Tim Carman reports that the broth ends up being on the sweet side and that the noodle portion is lacking. Still, it’s an interesting attempt at pho to-go and a novel way to get one’s pho fix.